We hope your New Year got off to a great start! Here at KLOTZ, we’re already working hard on driving progress in all areas. One of our best-selling products – the StraightLink SLW stage box series – has seen some moderate reworking to reflect users’ suggestions; the box is now laser-engraved, pigtail lengths were adjusted, and a cable grip has been added as a strain relief element to 12-channel and higher versions. We’ve provided new downloadable high-resolution photographs of the facelifted products, to enable you to update your websites and online presence. All eyes are on Northern Ireland, with the ceremonial reopening of the newly converted and extended Belfast Waterfront. Already among the world’s leading conference and event venues since its opening in 1997, Belfast Waterfront has now been expanded to cover a lavish total area of over 7000 sqm. 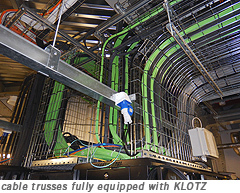 KLOTZ was closely involved in the transformation, supplying over 230 km of cables, 400 configured wall boxes and the same number of 19” panels. We hope you enjoy reading our newsletter. Since its opening in 1997, Belfast Waterfront has been among the world’s leading conference and event venues. The venue has now been expanded to a spacious total of 7000-plus square metres, and KLOTZ Cables have featured extensively in the renovation works. 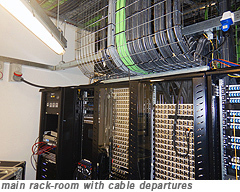 We sent more than 230 km of KLOTZ audio, speaker and video cables plus over 400 fully connected wall boxes and 391 19” panels, also fully connected, over to Northern Ireland. Conversion and expansion works are now complete, since the grand re-opening everyone can experience the new sound quality of the auditorium, of course equipped with KLOTZ cables. We moderately upgraded our bestselling StraightLink SLW series. The HV2D1P25 Hybrid Cable is designed for long-term mobile use in HD-SDI video applications. A single cable combines two video conductors (75 Ω), an audio conductor (AES/EBU, 110 Ω) and a power line (3 x 2.5 mm²). The HV2D1P25 is tailored to the needs of the broadcasting sector, where it is used to control monitors from the control room. The two video lines can be used as out and return lines or double up as out lines. The polished Cu strands of the video lines are enclosed in physically foamed PE dielectric medium and effectively protected from interference by a doubled braided tinned Cu shield. The audio line likewise has double shielding, combining foil and braided shields. Its characteristic impedance of 110 Ω complies with the widespread AES/EBU digital audio standard. The power line is generously dimensioned, with a cross-section of 3 x 2.5 mm². Sometimes transmitting a video signal just isn’t enough. What about providing a power supply for the cameras? Or a signal for the preview monitor? Those questions are exactly why we designed the HV2P15P Hybrid Video Cable. Two signal conductors and a power line – in a single cable! It’s the perfect solution for mobile HD-SDI links, e.g. from camera to vision mixer and preview monitor, including power supply. No more tangles! Like our VD083LP Video Cable for short distances, the HV2P15P is highly flexible and ideal for drum storage. Its outer jacket of abrasion- and notch-resistant PUR ensures the cable’s interior is well protected. The two ultra-finely stranded conductors are each insulated with physically foamed dielectric medium, while a double copper braided shield repels external interference. The sheathed power line is integrated into the cable and is interference-free. The HV2P15P has a transmission rate of 3 GB/s over distances up to 50 m.